Goniophlebium lachnopus (Wall. ex Hook.) Bedd., Ferns Brit. India 2: 163. 1868; Rödl-Linder, Blumea 34: 393. 1990. – Polypodium lachnopus Wall. ex Hook., Icon. Pl. : pl. 952. 1854. – Polypodioides lachnopa (Wall. ex Hook.) Ching, Acta Phytotax. Sin. 16: 27. 1978. Polypodium garrettii C.H.Wright, Bull. Misc. Inform. Kew 1930: 174. 1930; Ching, Contr. Inst. Bot. Natl. Acad. Peiping 2: 49. 1933; Tagawa & K.Iwats., Fl. Thailand 3: 571, f. 57.5 & 57.6. 1989; Boonkerd & Pollawatn, Pterid. Thailand: 284. 2000. Rhizome long creeping, 2.5–3 mm diam., dark brown to nearly black, densely covered with scales; scales thin, ovate with long tails, about 1 mm diam. with tails about 5 mm in length, irregularly toothed at margin, light brown, shining, clathrate. Stipes stramineous, 6–7 cm long, densely scaly at base, densely hairy upwards. Laminae linear-lanceolate, round at base, acuminate at apex, 25–50 by 6–12 cm, pinnatifid to pinnatisect; rachis stramineous, densely hairy throughout, scaly beneath; lobes up to 40 pairs, the upper ones gradually becoming smaller, the basal one or two pairs slightly deflexed, sometimes separated by a little longer ones next above or continuous with very narrow wing of rachis, middle lobes the largest, patent, straight, acute at apex, subentire or very slightly toothed at margin, narrowly oblong or gradually narrowing from base to apex, up to 6 by about 1 cm; veins reticulate to form a single row of large costal areoles along each side of costa, each areole containing a simple included veinlet, the other veins free, the apex a little inside the margin of lobes, hardly visible; rather thick, green, densely pubescent on both surfaces. 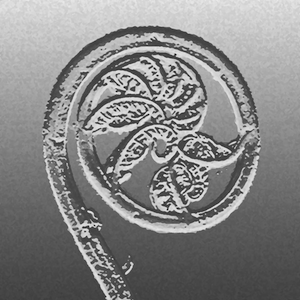 Sori round, terminal on the included simple veinlets, thus in a single row along each side of costa, medial or closer to costa, up to 1.5 mm diam., superficial . Nepal, N India, China (Yunnan). On mossy tree trunks in dense forests in limestone areas at 1000–1800 m alt. Middleton et al. 4944, Chiang Mai, Doi Pha Ti Do (E); Middleton et al. 5005, Chiang Mai, Doi Chiang Dao Wildlife Sanctuary (E).